Here are more of our original photo Chanukah cards featuring your multiple photos. 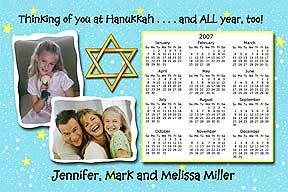 Calendar Photo Hanukkah Cards ©Send us 2 of your favorite photos with your message and personalization. 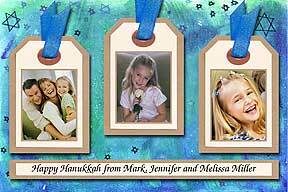 Tags Photo Chanukah Cards ©Send us 3 of your favorite photos with your message and personalization. Scrapbook Style Photo Chanukah Cards ©Send us 4 of your favorite photos with your message and personalization. (Blue ribbon is printed on card.) 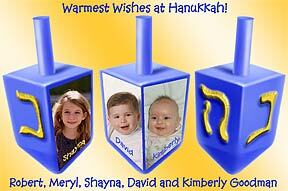 Dreidels Photo Hanukkah Cards © Send us 3 of your favorite photos with your message and personalization.